As the automotive industry evolved in America so did the nation's dog population. In his numerous editions of Training the Dog, beginning in 1927, Will Judy, Founder of National Dog Week, and publisher of the venerable Dog World Magazine, educated automobile drivers on how to safely accommodate man's best friend from behind the wheel. He urged them not to allow their dogs to put their furry faces out of a moving car's window or ride on the hood of a car or its running board! 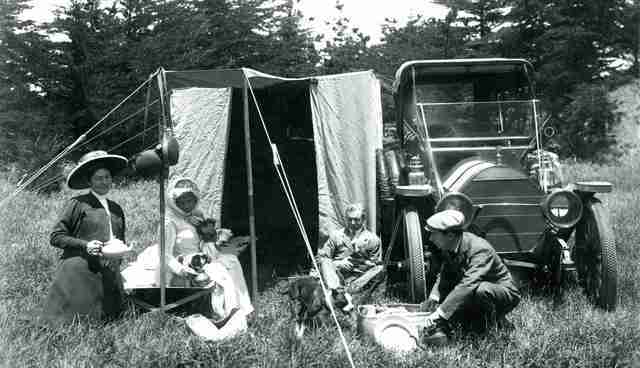 Long before Judy's advice to dog-owning drivers, however, New Jersey industrialist Harriet White Fisher embarked on a thirteen- month-long motoring journey that found her traversing four continents in a Locomobile with a Boston bull terrier named Honk Honk at her side. 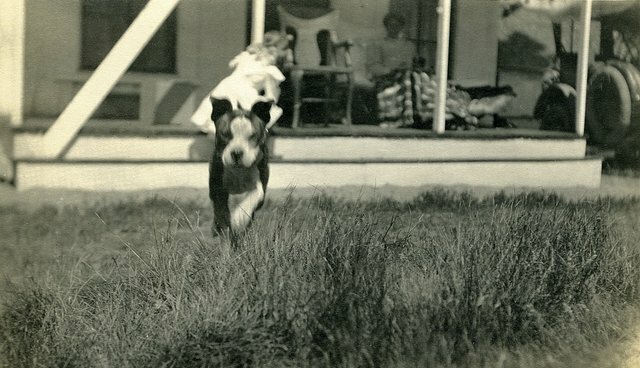 Honkie, as he was affectionately called, was only six weeks old when he was acquired by Harriet in Boston as a mascot for the global trip, gifted to her by the Locomobile Company. Harriet, an avid animal-lover, was smitten by the idea of a canine companion accompanying her on this history-making trek despite the concerns of those who feared the little dog would not survive such an ordeal. On July 17, 1909, Harriet and her entourage - comprised of Maria, her personal maid; Albert, her man servant; and Harold Brooks, her driver - left Trenton, New Jersey for New York City. There, the Locomobile was transported overseas to Paris where their international journey would officially begin. All went as planned until they arrived in Genoa, Italy, only to be informed that Honkie could not sail onboard with Harriet's party. Declaring that, "Honk Honk must not be forgotten!" she sullenly resigned herself to composing a letter that lovingly detailed Honkie's care during his solo journey on another ship. 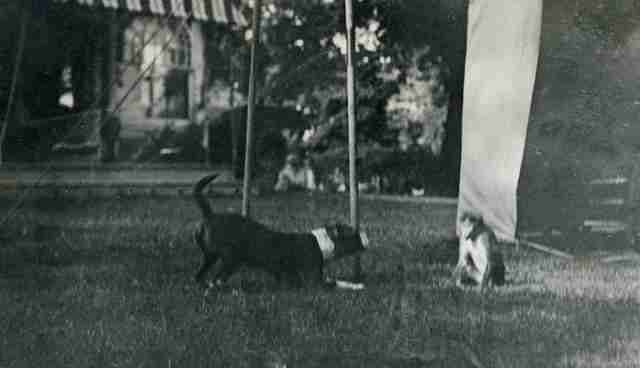 Harriet and Honkie were reunited in India, and the little dog survived his three-month long voyage through the jungles and palaces of the most remote regions. He survived encounters with wild animals, some humans with bad intentions, and over-feeding by his doting royal hosts. Sailing for Japan, Harriet was once again informed of the ship's "No Dogs Allowed" policy. Honkie was again left in the care of a ship's captain and crew. Wherever he went he was so loved by his caretakers, and by a family who temporarily housed him in Kobe that Harriet genuinely feared there were times he would not be returned to her. Traveling without Honk Honk in Sri Lanka (then Ceylon), a now pet-less Harriet fell in love with a little monkey she spotted playing among tea bushes on Sir Thomas Lipton's plantation, and welcomed him aboard. She named him Billikins and later introduced him to Honkie in Japan. But that wasn't to be the final non-human crew member to join Harriet's party. Before setting sail for her return to the United States, Harriet was presented with a Japanese Chin dog by members of the adoring Japanese Press. According to the American Kennel Club (AKC) this breed is "kept in the hands of the nobility and frequently given as gifts of esteem to diplomats and to foreigners who rendered some outstanding service to Japan." While trying to leave the ship in San Francisco, it was discovered that Harriet could not produce the required documents for bringing her pets ashore. Harriet unleashed a newsworthy tirade that was reported in detail in the San Francisco Call the following day. But rest assured, Harriet and her pets made it safely home and lived out their lives comfortably on her farm, Bella Vista, in Ewing, New Jersey.